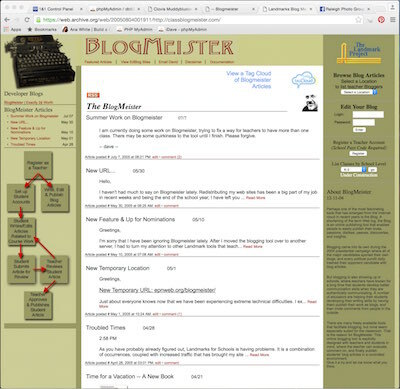 I launched Class Blogmeister in 2004, realizing that there were a lot of teachers who needed a blogging platform for their students, one that was designed for the classroom. I anticipated that the service would live for a couple of years, after which other more skillfully constructed and professionally supported services would be available. They were available, but teachers wanted to keep using CB and I wanted to keep learning from their inventive ideas and add features as they were requested. 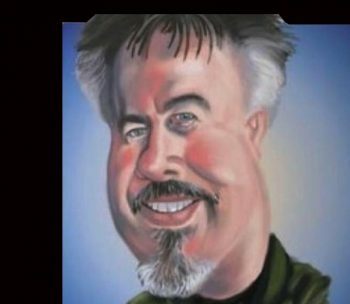 Now, 12 years later, I have mostly retired from speaking and writing, and my wife and I are spending much of our time in the foothills of North Carolina, helping and enjoying our aging parents. So, sadly, I will be closing Class Blogmeister around the middle of June this year. It’s seen a pretty good run, serving over 300,000 teachers and students from 90 countries, who have written nearly 1.5 million blog articles – and I have been the real beneficiary, learning from this amazing community. I want to commend everyone who has used Class Blogmeister for your adventurous nature and your steadfast adherence to the idea that teaching is an art. Student blogging requires courageous teachers – and I believe that “courage” is one of the central defining qualities of all good teachers. I thank you for your loyalty and patience, and especially for being a good teacher. I can think of no better compliment to pay.